Composite doors are the best selling product for replacing the front door in your home. There are many different types of composite doors from many different manufacturers. Answers to the most common questions about composite doors. Quality composite doors in a choice of colours, styles designs and locking options. 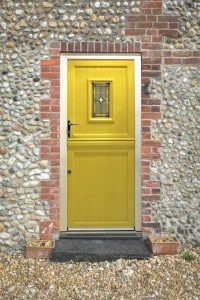 As your local home improvement experts, we have put together answers to some of the most common questions around composite doors. Contact us if you require information or have a specific question. There are two different types of composite doors, but both work around the same principle. That is a central core (foam or engineered timber) with an external and internal decorative GRP skin, in a choice of colours and styles. Why composite doors called composite? The name composite door comes from the fact that two different materials are used. Is a timber core composite door better than a foam core composite door? Composite doors give the customer a choice based upon price, quality, colours and designs. Do your research and you will see that both timber and foam core composite doors are independently tested for security. It is unlikely today you will find a door that is not secure. Where we believe timber core doors are better is the significant extra strength from using many layers of engineered timber as opposed to a foam. Not only is the timber core more solid, but it also produces a heavier door that feels much more like a timber door. Best of all, when you knock on a timber core composite door, the sound and feel is much more authentic compared to a foam core door. Are all composite doors white on the inside? A white door internally is the most popular colour for a composite door as it brightens up the interior a lot more, however other colour options are available. What is the glass used on a composite door? A quality composite door will have a toughened double or triple glass unit. This can then be customised with leads, colours or any design. The glass is designed to provide long service life and be thermally efficient. The colouring process is undertaken at the same time as the door skins are created. We do not recommend you do not paint a composite door that is still under warranty or a recently installed product. Is a composite door energy efficient? Yes. The internal core, the quality glass unit and the multi-chambered PVCu frame result in a very energy-efficient product. What should you clean composite doors with? We recommend a mild, warm soapy solution with a soft sponge. Routine cleaning is all that is required to keep your front door looking new for many years. A quality composite door will be provided with a 10-year warranty. However, a recent independent study from Provident Mutual and the Building Research Establishment, a correctly maintained composite door is estimated to provide a lifespan in excess of 30 years. SGK Home Improvements provide the market leading Endurance door, renowned for its superior strength solid timber core. We think the Endurance composite door can’t be beaten for quality, security or value.